Caltrain HSR Compatibility Blog: Headspans and Poles, Oh My! I am in over my head here, but what about a third rail and paddle like BART? Just on the peninsula. The ROW is fully separated. The speeds will be the lowest on the system, but maybe not low enough? Huge improvement for the backyards. Correct me if I am wrong but Eurostar used a retractable paddle in England when it first opened. "In physics and geometry, the catenary is the theoretical shape of a hanging flexible chain or cable when supported at its ends and acted upon by a uniform gravitational force (its own weight) and in equilibrium. The curve has a U shape that is similar in appearance to the parabola, though it is a different curve." Also as you build a suspension bridge you string a catenary cable and as you add the load of the deck structure it pulls the cable into a parabola shape. Third rail is close to the ground, runs at low voltage (in the ballpark of 1000 V) and therefore requires much higher current. Drawing enough juice from a 3rd rail to power fast trains (rated at roughly 10 megawatts) is technically infeasible. 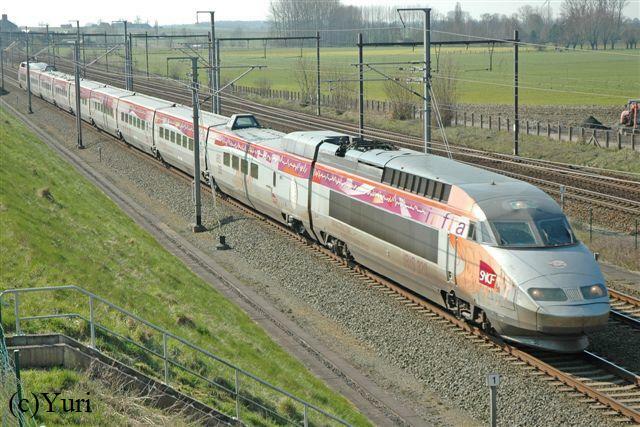 Eurostar HST's did once use 3rd rail, but they could only develop about one quarter of their full rated power due to the above-mentioned limitation. That made their performance (speed, acceleration) positively anemic. 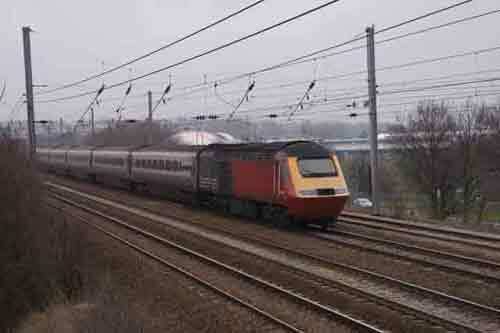 That got fixed with the opening of the Channel Tunnel Rail Link, electrified with standard 25 kV overhead. the poles would indeed be the least obtrusive and possibly also the cheapest solution. I'm not sure if any of these designs is more resilient in earthquakes than the others or, if that even matters. Note that the two center tracks require greater horizontal separation than usual in US railroad engineering due to relative speeds in the 250-300mph range. You don't want the bow waves to blow out the windows. third rail would be possible in principle, since all four tracks will be fully grade separated anyhow. 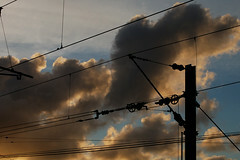 However, third rail operates at lower voltage (e.g. BART at 1500 VDC), which means power is constrained by the electrification system. In addition, every single trainset would have to specially adapted with a third rail pickup and the associated power converted. It's a much better idea to stick with standard overhead catenaries at 25kV AV single phase @ 60Hz. Is the third rail that inferior to the overhead centenary? Is BART suffering from this inefficiency due to lower voltage? Is it too much to hope that BART could be upgraded to 25KV overhead power? I expect the tunnels are not tall enough to even consider overhead. It would be a major upgrade, but there is time. After the BART infrastructure serves a lifetime maybe it could be replaced with better rails, power supply, and rolling stock. Then go ahead and make it standard gauge. Hmmm. @James - BART is a different cup of tea, and it's just fine the way it is. It is both much lighter (by about a factor of 2, on a per-seat basis) and much slower (80 mph max) than HSR. 3rd rail can't provide enough juice to accelerate 800 tons of train to 100 - 150 mph, let alone 220 mph. 3rd rail would *severely* cripple HSR and Caltrain, and put them out of step with the de-facto world standard. It would complicate off-the-shelf acquisition and blow budgets and schedules sky high. We really, really don't want to go there. I believe there are also contact issues with 3rd rails as you exceed 100 mph. 3rd rail is good for subway/rapid transit because it is more durable/reliable than overhead catenary (which can, as Clem points out, get snagged). But it's not a good choice for HSR. There certainly are contact issues at high speeds. The largest region of 3rd rail, and one of the very few places that it's used for regional (as opposed to metro) service is the former Southern Railway region in England, where the longest run is about 100 miles (London Waterloo-Weymouth). There was extensive testing in the 1980s, to try to find the highest speeds that could reasonably be attained with this transmission system, and the record run was 108mph - still the world record for third rail. The highest speed used in service is 100mph. The power contacts cannot reliably operate at higher speeds. There are also power issues - Third rail has to be much lower voltages, typically 750V to 1500V (and is usually DC rather than AC) because of the risk of discharge. This reduces the amount of power available. 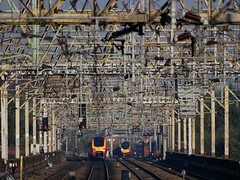 On the other hand, third rail has less aesthetic impact than overhead, is physically smaller (meaning that tunnels can be smaller and therefore cheaper) and is more easily compatible with existing infrastructure (ie if you are electrifying an existing line, you don't need to raise bridges to fit the wires underneath). For cost and safety reasons, overhead is generally preferred unless there is an existing third rail system to be compatible to, or unless it's an entirely-underground-tunnel metro system. I look forward to US passenger rail catching up with Portugal and Czech systems. The US needs to wake up and join the rest of the world. We have focused too much for too long on the Cold War and the automobile and have been left behind. To some extent the US investment in the Cold War left other countries free to invest in rail infrastructure. Nothing like a swift kick to get the US moving. 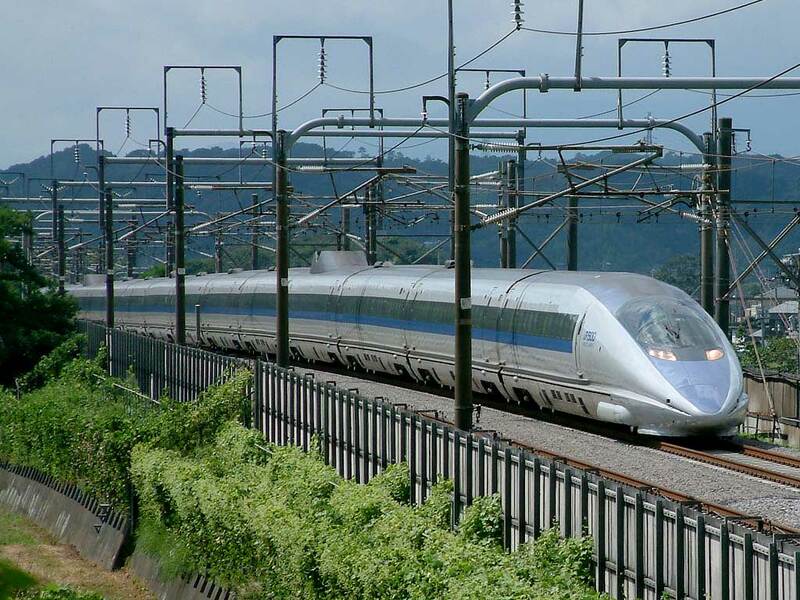 CHSRA wants to use UIC-compliant off-the-shelf bullet trains from Europe or Asia. for example, a fully equipped 14-car Alstom AGV with 650 seats and 12,000kW worth of traction motors weighs 510 metric tonnes - not 800. 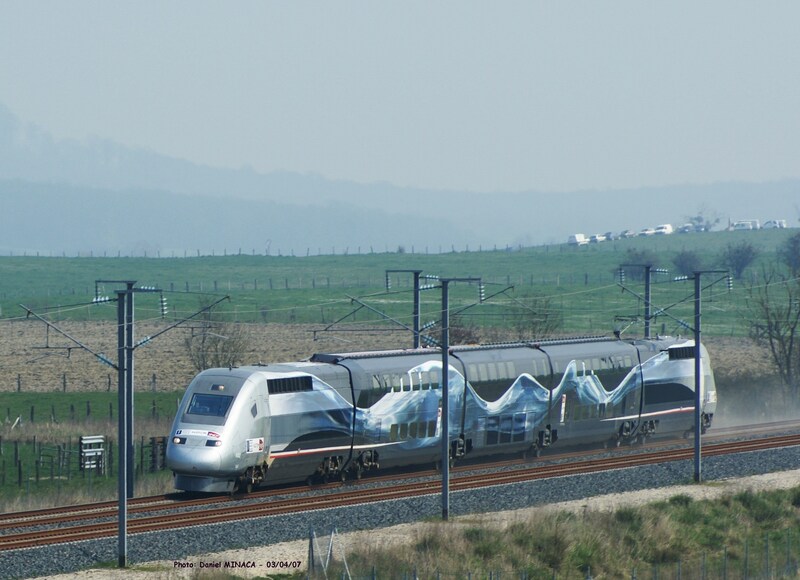 It's only the FRA in the US that forces passenger trains to be built like sherman tanks. 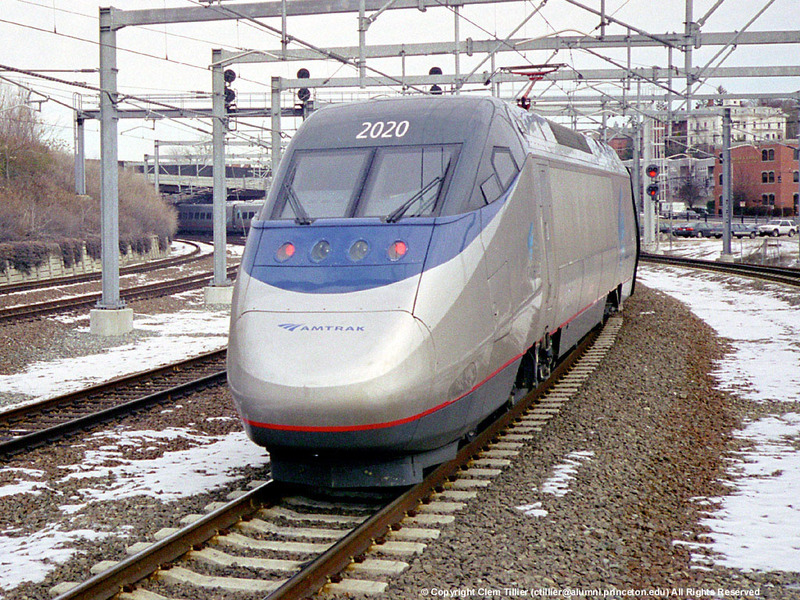 Avoiding the Acela Express debacle is a big part of why CHSRA decided to build all-new tracks wherever it is at all possible to do. In the few locations where it isn't, guaranteed time separation between FRA-compliant and non-compliant equipment is required. Basically, FRA treats anything that does not conform it its own inferior crash safety regulations (see Appendix C) as if it were toxic waste, unless it runs on its own tracks. BART equipment is also non-compliant. The MUNI's trolleybuses have poles that retract as soon as they lose contact with the overhead. Ugly messes still occur, but much less often. I've seen poles hook the overhead and rip down the energized lines into the street, with sparks and all. I assume there is some sort of system like this for railway pantographs. I assume there is a system that retracts HSR pantographs when something happens, not a system to make HSR pantographs rip down overhead. It's the result of a lifetime of California public education, most post-Prop 13. * Two tracks > 160kmh flanking central masts: track centres 6.8m. * Two tracks, one <= 160kmh, one > 160kmh: 6.4m. Oh yes, clearance from > 160kmh track to any adjacent wall or railing: 3.8m. (3,3m <= 160kmh). On the other hand the uniform 4.7m track spacing CHSRA show is wasteful and unprecedented, and can only be explained by Advanced American Engineers -- like those who lost the Maris Climate Orbiter -- pulling a figure like 15'6" out of the air and deciding it was a good number for something or other -- perhaps grain silos sidings in Nebraska? How do they dream this stuff up? Anyway, the German new construction standard for plain track spacing is 4.0m for <= 200kmh, 4.5m for > 200. Shinkansen centres are 4.3m. We can pretend that CHSRA consultants knew what they were doing about when they sketched out the typical cross-sections in the EIR, but I wouldn't bet on it, and I wouldn't bet anything at all on US regulators allowing tighter clearances, smaller safety zones, and less evacuation space than existing and well-regarded foreign systems. The cross-sections are only going to get wider and the impacts larger, and the costs greater, in other words. I noticed that there are very few HSR lines in the world using one pole to support catenaries over two tracks. 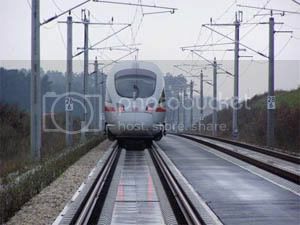 The most common cases are one pole supporting one track, and for areas there are more than a pair of tracks, it is either supported with gantries or 4 poles. For station areas, I don't think gantries would be an issue, as many HSR station structure had Catenary support built into their super structure.